Recent research has shown the value of mindfulness in reducing employee work-related stress, boosting creativity and productivity and providing an array of benefits to an organisation. Mindfulness is promoted as a state of mind geared towards focusing your attention and awareness on the present, including any physical sensations, thoughts and feelings. Practitioners try to put worries and extraneous concerns out of their minds and commit themselves to calmly accepting things that cannot be changed. Mindfulness is starting to be appreciated as more than simply a stress-busting strategy. Studies suggest that mindfulness can deliver direct benefits in its own right, improving cognitive performance, creativity, awareness and emotional intelligence. In some firms, recognition of this is driving a shift from the traditional and exclusive focus on monotonous productivity to mindful attitudes in every sphere of work, with beneficial outcomes for employees and companies alike. At first glance, mindfulness and productivity seem like peculiar bedfellows. 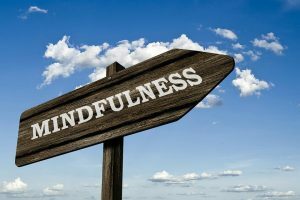 Aspects of mindfulness, such as living consciously, willingly maintaining focus and being aware only of the present moment, seem to be diametrically opposed to the demands of business productivity, with its focus on increased output and greater efficiency. How, then, can mindfulness advance a firm’s productivity? The answer lies in the fact that our economy is arranged around knowledge. Organisations operating in our knowledge economy rely on the key resources of leadership and employee talent. Productivity originates from inputs, including time, and the value added by the work of employees and leadership. Organisations increase productivity by either increasing the value added or reducing the amount of time required to create the added value. Practicing mindfulness helps your employees to focus their attention on matters important at the present moment. Over time, utilising mindfulness can develop truly resilient organisations with employees who feel happier and more inspired and empowered. Happier and more empowered employees, in turn, help to increase customer satisfaction by delivering additional value. Customers receiving greater value return again and again, in much the same way as happy and inspired employees stay working at the same company for longer than usual. Modern employees are forced to juggle the competing demands, expectations and volatile and dynamic priorities of their personal and professional lives. Professional success increasingly calls for employees to invest longer hours in work and even to be ‘on call’ when not in the office. The proliferation of technological devices that allow people to respond to work-related issues on demand creates a tendency for distraction, leading to a modern way of life that feels distinctly stressful and fragmented. Mindfulness aims to calm the constant noise of the modern mind by focusing the thoughts on what actually matters at that moment in time. Companies that implement mindfulness strategies have employees who can better empathise and who are more in touch with their surroundings. This helps them to make better decisions. More mindful leaders create a balanced and happier work environment. Their heightened sense of situational awareness and improved listening skills help to mitigate the negative, even dysfunctional results of the traditional outcome-focused approach. Mindful leaders are also more likely to be open to learning, innovation and experimentation. All of this produces organisations with a high-performance, humanistic culture which engenders decision-making and learning at every level.